The ability to schedule messages is made possible on my iPhone thanks to the wonderful BiteSMS app, but since I’ll be making the transition from iOS to Android this week having picked up the HTC One, I just had to go out and find an Android app offering this vitally important functionality. 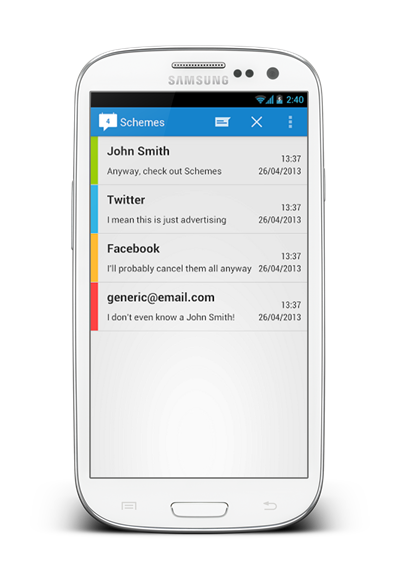 I perhaps got more than I bargained for in my discovery of Schemes, an app which not only facilitates the sending of SMS messages at predisposed times, but also emails, Facebook updates and Tweets. I’m one of those individuals that like to prepare messages in advance, before setting a timer and letting them be sent at appropriate times. For example, if I want to ask quite an important question from somebody, but don’t wish to wake them up late at night, I can set that message to go through in the morning. Of course, I could simply set myself a reminder to send the message at a later date, but this just adds another task to my seemingly endless list. By preparing the message in advance and setting a time for that message to be pushed, I can then just forget about it, and thanks to Schemes, I will be able to do so on my Android. Not only is Schemes fully integrated with Twitter, Facebook and Gmail right off the bat, but it’s packaged in a rather slick Holo UI. When scheduling SMS, your messages are automatically added to their relevant threads within the Messages app, so as to avoid any confusion, and although this is still at in beta phase, it’s an incredibly polished experience. As noted on the app developer’s official thread over at XDA-Developers, there’s still quite a bit of work to be done, but with a Pro version and photo sharing just a couple of the many entries to the Schemes ‘to-do’ list, this is one very exciting little application. You can try it out via the link below, but please remember that since this is indeed a beta, it may have some lingering bugs and teething issues which you might want to resist.